It’s Christmas time: a special time of year where everyone is spending time with loved ones, and may even exchange some well-thought-out gifts. And yet somehow, it seems as if it’s so much easier to select the perfect gift for everyone around us, except for our significant other. We know their favorite movie, the way they like their eggs cooked, and what annoys them, but when it comes to selecting the perfect Christmas gift, we draw a blank. Keep on reading, because we have all of the best Christmas gifts for her right here! Now that you’ve had the chance to do a quick overview of all of the best Christmas gifts for her, you’re probably interested in reading more about some of them. Keep scrolling for some in-depth, unbiased reviews! Most of us out there care about our appearance, but women seem to care especially about how they age. If the woman that you’re purchasing your present for has expressed frustration over signs of visible aging, it may be nice to pick up a preventative anti-aging cream for her! Some of the best anti aging night creams out there are the prescription ones. 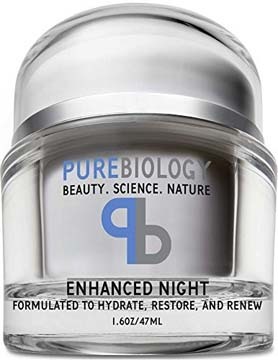 There aren’t as many eco-friendly, or more gentle creams which produce the same results out there, but with the Pure Biology Anti Aging Night Cream, you can have it all! This skin care treatment is one of the strongest non-prescription anti aging blend you’ll find out there. With base ingredients such as pure Retinol, hyaluronic acid, along with the Fision Wrinkle Fix, she’ll see some notable wrinkle reduction after using it for just a few weeks. So, what exactly does it do? It works to hydrate, renew, as well as defend against free radicals and other factors which can speed up the appearance of aging. The anti aging night cream reduces wrinkles, fine lines, and age spots while simultaneously working to firm and tighten skin. Baobab Tien extract gives you super-durable hydration (up to 48 hours), which is also excellent for firming the neck and chest. Haven’t heard of Baobab Tien before? That’s okay, you’re not alone! It is an extract made up of amino acids and antioxidants which has been proven to promote skin recovery after exposure to UV rays, as well as providing durable hydration. Does she have sensitive skin? No worries! She’s going to really enjoy the Pure Biology Night Cream. It’s GMO-free, cruelty-free, and also doesn’t contain any artificial fragrances or parabens! That makes it an excellent cream for those who really care about what is going into their bodies, and is also more gentle for those with sensitive skin. Well, if you’re looking to purchase a day cream, or one with SPF protection, this is not the product for the woman in your life, as it can only to be used at night. 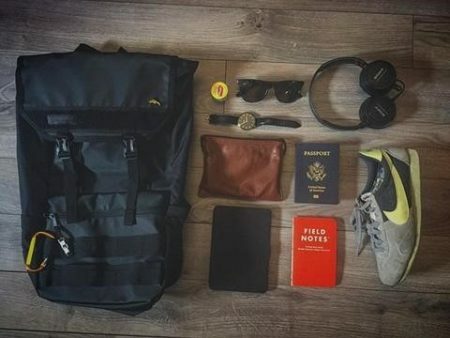 Timbuk2 is a company out of San Francisco known for producing products made to make your life a bit easier. 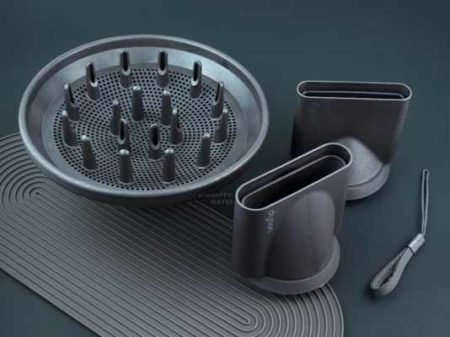 All of their products are made of the highest-quality materials, are listed at a great price point for what they offer, and most importantly – are functional. The Spire bag is no exception to this, and we would gladly carry it around everywhere a backpack or bag is required. Designed exclusively for Apple, their backpack provides your MacBook Pro and/or iPad a whole lot of protection, no matter which conditions you’re in. 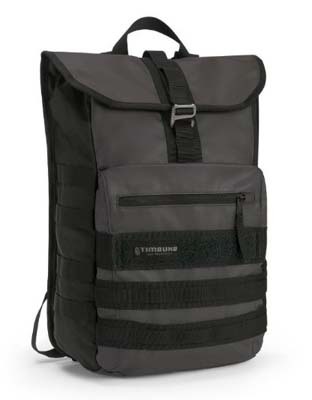 Timbuk2 bags are generally very popular in cities such as San Francisco (obviously), Seattle, and New York, where they get a good amount of rainfall each year. Not only is this bag resistant to serious drizzle, they’re also ultra-convenient and stylish, to boot. But for now, let’s get back to the waterproof part. Thanks to the water-resistant TPU, you have a sturdy bag that will hold up against regular commutes in the rain, bumping up against other commuters, metro doors, and so on. The canvas fabric construction adds to the durability, as well as making it just outright look good. 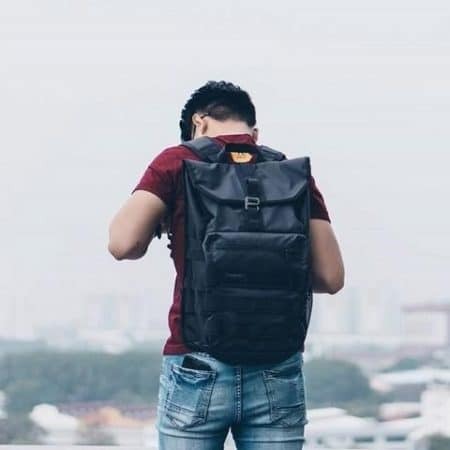 A common issue with waterproof backpacks, is that they have a smaller capacity, as they’re often just used for light hiking or water sports, where not a lot of volume is needed. Expandable volume through the flap or roll-top main opening provides the versatility in fashion, as well as easy access to your iPad, Mac, phone, books, or whatever else you need to carry around. The custom-fit strap design provides a more comfortable feel to suit your preferences. The removable sternum strap helps to take the weight off of your shoulders, and the ventilated back panel makes sure to keep your back cool with proper airflow. Have you ever heard the saying, “It’s all in the details”? Well, that could easily pass as Timbuk2’s motto. Their attention to detail really makes the bag what it is. Anodized aluminum hardware is utilized for not only a sophisticated, high-quality look, but also quiet, reliable entry and exit. A front zip pocket allows quick entry for things like your boarding pass, and a secure inner pocket lets you keep earbuds, credit cards, your ID, and keys available to you at all times. The internal organizer keeps everything in its place, eliminating the need to rummage through just to find a pen or other small, important items. The large main compartment is where you’re going to keep your books, a change of clothes, and other travel essentials. If you do a lot of hiking or commuting, you’ll appreciate the elasticized, external side pocket where you can always have your water bottle handy. An exterior daisy chain webbing provides attachment points for things like carabiners, helmets, and so on. Oh, and if that weren’t enough, they’ve even included an on-strap bottle opener just in case you want to crack open a cold beer at the end of your journey! Sometimes, the most romantic gift for the wife can be a tech tool. Yes, women can be techies, too! 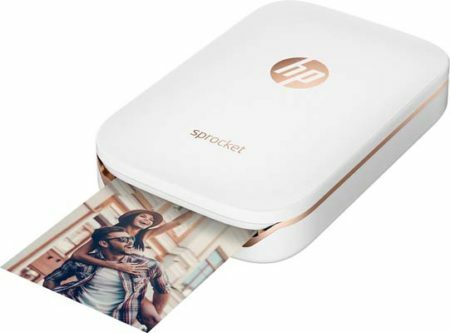 Even if she’s not that technologically-driven, we can assure she’s going to love the HP Sprocket Pocket Printer. 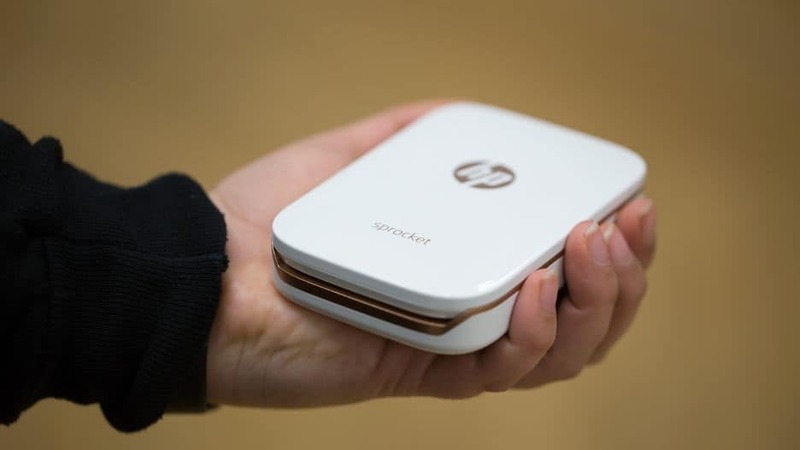 The printer is lightweight and compact enough (about the size of a deck of cards) to carry in a bag, and easily connects to most phones. Covered in a smooth plastic skin (either black or white), it feels nice and high-quality in the hand. Not that into tech stuff? No worries! The controls are very basic, as there’s only a power button, a battery indicator light, and a USB charging port. To set it up, simply charge the Sprocket, connect it to her phone via Bluetooth/NFC, and download the free app, which works with both Android or iOS. Then, open the camera roll or connect through Facebook, Instagram, or Flickr, and choose which photos you’d like to print out! Does she enjoy editing photos? Then she’ll love the fact that she can edit photos with graphics, borders, text, filters and more directly in the app! On average, it takes less than a minute (around 30 seconds or a bit more), and happens so quietly, you’d hardly know that it was printing out snapshots! So, how was the print quality? To be honest, we found it to be average, at best. The device uses Zink, or “Zero Ink”, technology, which shows lines in the photos oftentimes, and the colors seem to be a bit dull. However, all things considered, it’s still an excellent idea for a Christmas gift and a fun little device. Not only that, but it’s pretty affordable. Especially considering similar devices, we really don’t think it can be beat for such a low price! Looking for one of the top 10 gifts for women? If it involves coffee, we can guarantee it’s one of them. 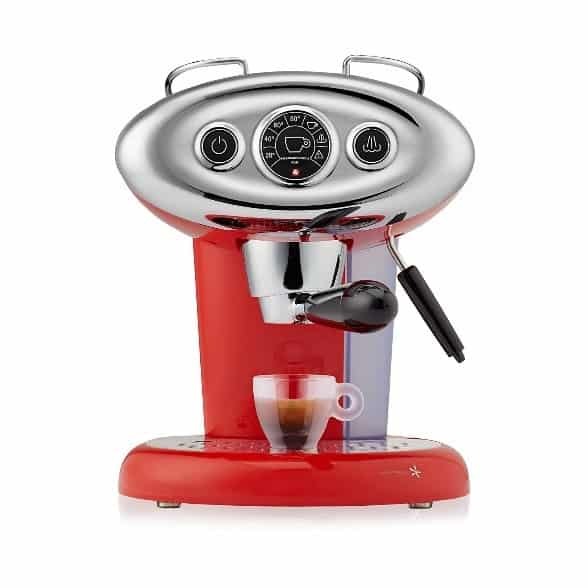 The top of the top for coffee lovers, is the Francis Francis X7.1 Iperespresso Machine (we love the red color). Not only is it gorgeous, it works to put out some of the best drinks in the world. Designed by renowned Italian architect, Luca Trazzi, this stunning machine completely transforms a kitchen or coffee bar area, let alone, will add some spark into her life. It features a slender form with a beautiful integrated control panel with soft-touch buttons. What exactly does it produce? It puts out a rich, full-bodied espresso any way she’d like it! She could have just a cup of espresso on its own, or use the Pannarello steam wand to steam milk and make a nice cappuccino or hearty latte; even a flat white, should she like! What coffee is used with it? The machine comes with iperEspresso capsules. They feature a unique brewing technique, making sure coffee never touches the actual machine. Each capsule has seven grams of ground illy coffee to ensure the perfectly smooth espresso each time. Their patented two-stage brewing process creates aromatic and full-bodied espresso with crema that is made to stay. The first stage happens in the chamber, where coffee is infused with water under pressure, extracting more flavor and aroma. The second stage pressure-forces it through the e-valve, where the aromatic oils emulsify to make coffee properly. You’ve probably already heard of the Dyson name before, although most likely not relating to hair dryers; rather vacuums. However, regardless of the product, Dyson consistently produces high-quality ones. 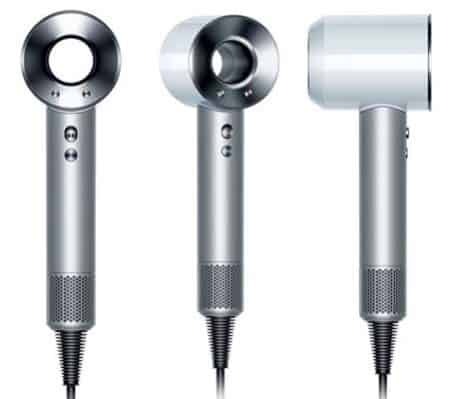 The airflow innovator has yet again created one of the most technologically-advanced beauty products as of yet, with the new Dyson Supersonic hair dryer. While it absolutely does live up to expectations, it does come at a price; a very high one, so keep that in mind. Despite hair dryers having been around for literally centuries, consumer models haven’t altered much since then. Actually, it’s been over 6 decades since the last notable change in the typical hair dryer design, with putting the motor inside the casing. With your traditional dryer, the motor is in the head of the device, which is actually what makes them kind of awkward to hold due to the top-heaviness. Due to this as well, the dryers are usually loud and can even overheat. So, what’s the difference between those and the Dyson? This best hair dryer features a much smaller, more efficient digital motor, which allows for 13 litres of air per second to shoot from it! That means ultra-fast drying, so that you can focus on the fun. What’s more, is that the motor is also moved from the head to the handle, which is why it features the oh-so-modern design where you can see straight through the barrel! Now, let’s talk about the barrel. There’s honestly not a whole lot to talk about; there’s a microprocessor which monitors temperature 20 times per second, which ensures it’ll never overheat and/or burn out. Regular hair dryers tend to keep increasing in temperature as it’s used, which is why you’ll get that burning smell sometimes. The Supersonic actually makes sure it never goes over 120 degrees Celsius. 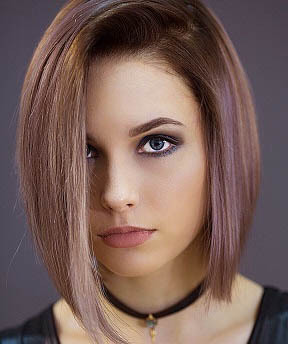 The best professional dual voltage hair dryer has 4 heat settings, 3 airflow settings, a cold shot, ionizer, as well as the removable filter at the bottom. That means a whole lot of versatility to allow for whatever works best for your hair type and desired style. Something else unique about the Supersonic, is the magnetized attachments and nozzles. It may seem simple, but it’s actually really convenient and user-friendly. It’s one of those additions that will make it all that much harder to choose a regular dryer. The magnetic addition allows you to instantly snap on a diffuser, styling concentrator, or a smoothing nozzle, without the hassle. You’ll also find a non-slip mat and a rope hanger, so you can hang the dryer from a hook wherever you choose to store it. Now that you’ve had the chance to look through each of the best Christmas gifts for her, which one will you be selecting? 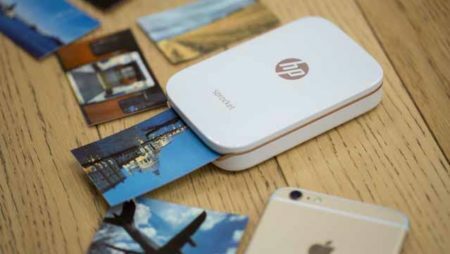 If you are still unsure, we personally love the HP Sprocket. While each one of these are excellent Christmas gifts for the woman in your life, this one covers all of the bases. It’s relatively inexpensive, it’s easy to use, it’s unique, it’s thoughtful, and it’s something she can use with and without you. It also works with just about every smart phone! So, which one of the best Christmas gifts for her will she be unwrapping this holiday season?